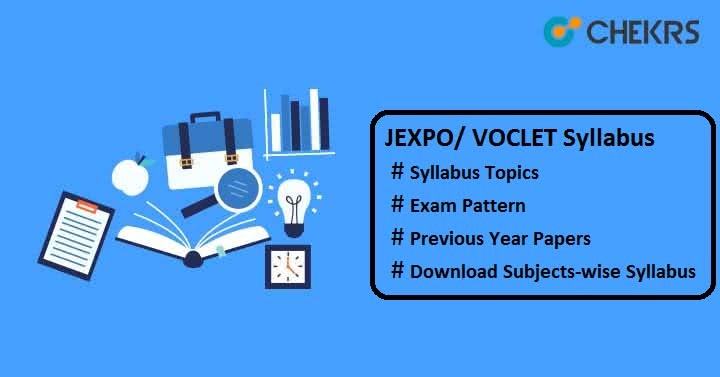 JEXPO/ VOCLET Syllabus 2019 Pdf Download: West Bengal State Council of Technical Education (WBSCTE) conducts entrance test every year to provide admission into polytechnic courses. To get admission in the First year of Diploma courses in the field of engineering & technology, candidates need to check the complete WB JEXPO Syllabus along with the JEXPO Exam Pattern. The syllabus is comprised of class 10th Mathematics & Science subjects. Here we have provided the complete topic-wise syllabus, go through it and start preparing for the exam. Aspirants preparing for VOLCET-2019 must check the given VOLCET Syllabus including important topics. The syllabus is prescribed as per the WB State Council of Technical and Vocational Education and Skill Development (Vocational Education Division). Applicants must know the Exam Pattern before appearing for the exam, as it guides how to attempt the paper and score good marks in examination. Marking Scheme 1 mark will be Given for each correct answer. No negative marking. Candidates who have completed the entire syllabus need to check the JEXPO Previous Year Papers to get rough idea of original papers. For better preparation, you should give Online Mock Test on a regular basis. Solving Sample Papers will help you to improve your speed and accuracy and you will learn how to manage the time. Here we have provided the Question Paper Download link to help those candidates who are looking for the previous year question papers. Still, you have any query related to WB Polytechnic Syllabus and exam pattern or previous year question papers, you can write your question in the below comment section and wait for our response. Good Luck!! !